Why we need AOMEI PE Builder? To answer this question, we should know what is Windows PE. The full name of Win PE is Windows Pre-installation Environment. In this environment, you can do many things, such as recovery, fix error, anti virus and so on. However, traditional Win PE has many limitations. As other Windows built-in program, Windows PE only provides an idea, Windows is a platform, which can’t do everything well. Thus, many third-party software companies developed all kinds of software to make up of Windows programs’ disadvantages. 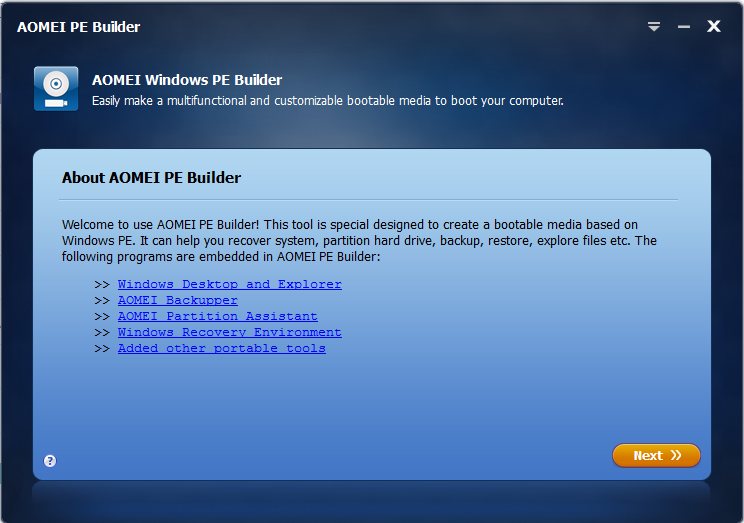 AOMEI PE Builder is released by AOMEI Technology to create bootable environment based on Windows PE, and AOMEI PE Builder supports different bootable medias. AOMEI PE Builder is a free tool. This freeware seckills many similar software. You may ask what advantages AOMEI PE Builder has compare to original Windows PE. Using AOMEI PE Builder, you don’t need to install AIK or WAIK, or prepare a Windows installation disc. The environment created by AOMEI PE Builder has a user-friendly graphical window and a familiar Windows 7 interface. 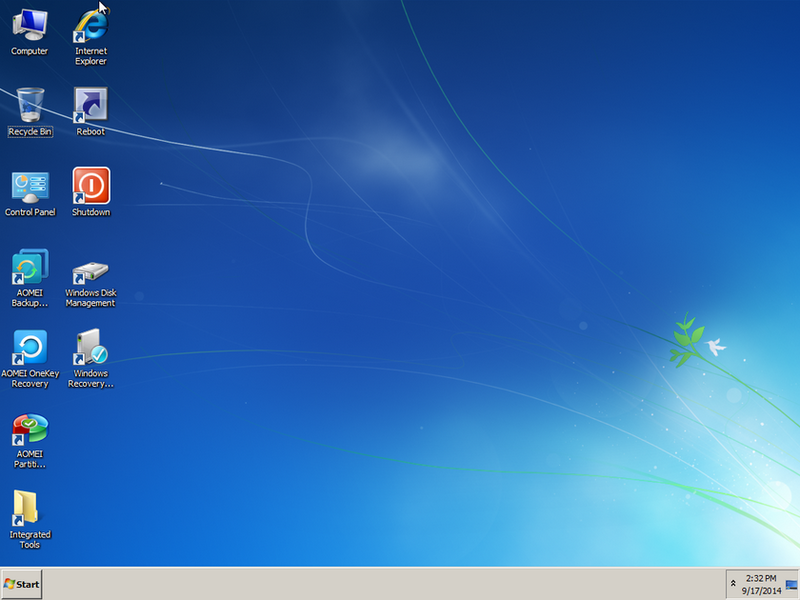 It includes desktop, Windows explorer, start menu, task bar, Windows Recovery and so on. 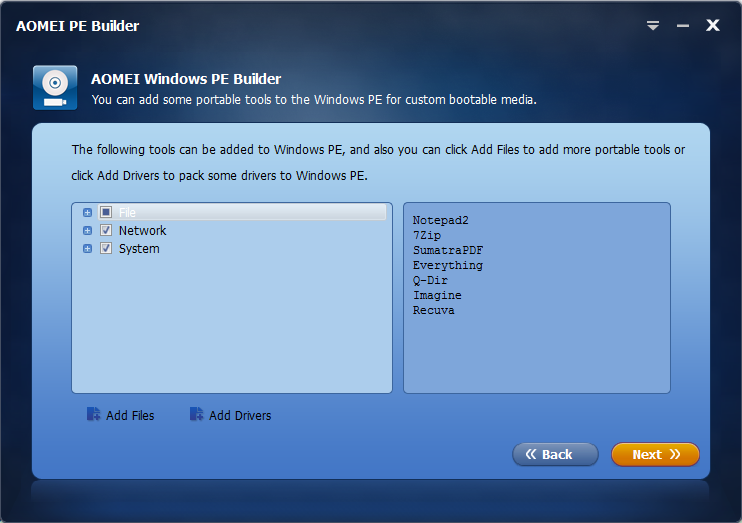 AOMEI PE Builder integrates many tools, and is able to pack portable applications and drivers. Details of the two function we will explain later in this article. AOMEI PE Builder created Windows PE can connect to network, through the network, you can do many tasks, such as off-line anti virus, maintain system with convenience. This is a welcome and brief window. There are several anchor texts link to AOMEI PE Builder’s tutorial articles on official website. Question mark at the right bottom links to AOMEI PE Builder’s help page. Read a while, just click the yellow Next button to go next step. The second step as above picture shows. Almost all system supports creating the bootable media. AOMEI PE Builder supports Windows 7, 8/8.1 and Windows Server 2008R2/2012, no Windows XP, Vista and Windows 10. If it is OK, click Next again. IrfanView: It is a very fast, compact and innovative FREEWARE image viewer/converter. This is another key step. There are three selections. 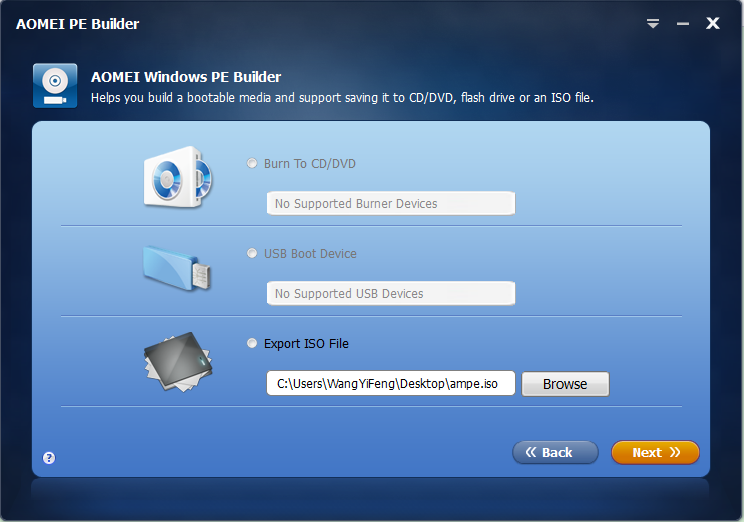 AOMEI PE Builder supports saving it to CD/DVD, flash drive or an ISO file. Next button on this step is the last click. Once click it, AOMEI PE Builder will commit the task. Wait minutes, you will get the bootable media. 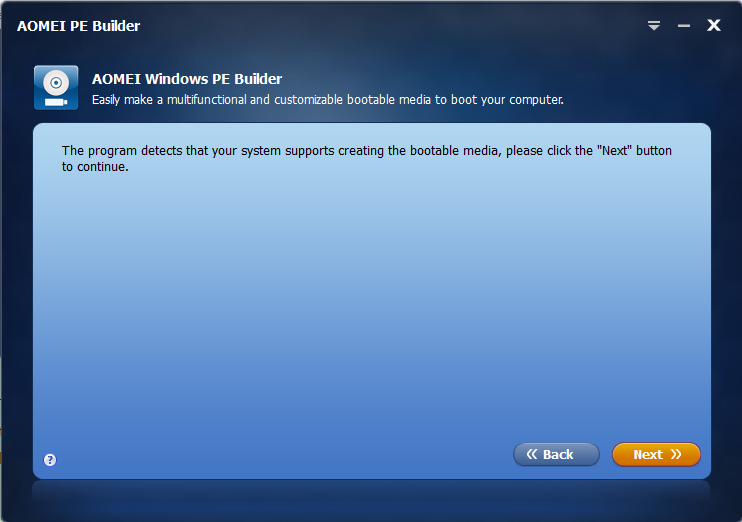 Forgot somethings, the Windows PE boot media built by AOMEI PE Builder contains two famous AOMEI products’ free editions. Hard disk partition manager – AOMEI Partition Assistant Standard Edition and complete backup software AOMEI Backupper Standard Edition. The former software helps you to resize partition and do other partition optimization tasks, the latter helps you backup files and do other backup and clone tasks. Because this AOMEI’s PE can be connected to network, you can backup system to NAS or network shared directory easily. AOMEI PE Builder will do you great favors. Preparation always better. When system can’t launch, you can enter into the environment with PE Builder and transfer important data out. When machine breaks down suddenly due to virus attack, you can use PE Builder to enter the environment and download off-line anti virus software. Then, clean up those viruses and rebuild your system. If you forget login password, firstly enter Windows PE system under help of PE Builder, then reset password by NTPWEdit is OK. In a word, AOMEI PE Builder is an excellent product.